I Need A Wild Turkey! I’m adding this to my wish list right now!! A while back I came across a funny typo on Amazon.com. The title of the book RSPB British Birdfinder was instead indicated to be a Nirdfinder. The error has since been corrected. If you see an error in a product description or title on Amazon, it’s easy to submit editing suggestions. Just scroll down to the bottom of the product page to the blue Feedback box and click on the appropriate link to either update product information or provide feedback on images or price. Did you get a new Wingscapes BirdCam for Christmas? Consider sharing your photos with the Wingscapes BirdCam Flickr group. The group is fun to browse, with BirdCammers located all over the world. Your photos can contribute! At one time the creators of the camera kept a life list of all species captured via their product; I’m not sure they still do this, but you never know. Your cam might just capture something that’s never been BirdCammed before! 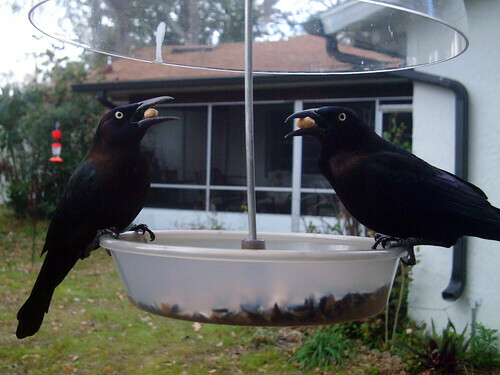 Common Grackles enjoying suet balls in Florida: Caught on a Wingscapes BirdCam! I was looking at bird houses an Amazon.com the other day when I ran across this Perky-Pet feeder. The Tufted Titmouse on the left side seems to be having trouble using the feeder. The unconventional titmouse gets around. I found him on a Birdscapes feeder, too. Maybe it wishes it was a goldfinch or a nuthatch. With all the chaos I’ve experienced these last few weeks, I thought it was a good time to post my first caption contest with this funny (?) photo. It is Photoshopped from an original I’d really like to link to, but my computer is in the shop and I can’t find it in my jumble of backup files. So you’ll just have to trust me that it’s not really modified that much, I just removed a couple of stray geese. If you click on the image to see the large version, you can see the extent of my Photoshopping skills (not so hot). Post your clever caption as a comment on this blog post. Up for grabs is our shop-branded I Brake For Birds license plate frame. The contest is open to everyone (global). Post your caption by Friday, June 10th. The winning captionist (or captionista) will be chosen and notified sometime on Saturday, June 11th (hopefully – told you things were kind of chaotic around here). Good luck! This week we’re kicking off a campaign for Warbler Neck Awareness Month in May. Warbler Neck (WN) Awareness is symbolized by a cerulean blue awareness ribbon-feather. What is warbler neck? Who suffers from Warbler Neck, and what are the symptoms? Is there a cure? We’ll discuss these topics and more over the next few weeks. We’ll also be sharing our new line of Warbler Neck Awareness t-shirts and gifts. These products feature original designs with the cerulean blue awareness ribbon-feather and other illustrations and slogans promoting Warbler Neck Awareness. Join us here at MagnificentFrigatebird.com and at our sister site, Birdorable, for more about Warbler Neck over the next few weeks. This week’s highlighted shirt, Beast of Birding, is for all you Stones fans. Did you know the boys were birders? Bette, too, though she had to change some of the lyrics to suit a female singer birder. Rock on! 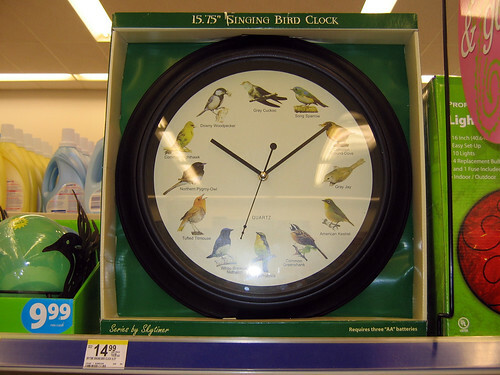 This clock is sitting on the shelf at our local Walgreen’s drug store. I’ve thought of buying them out just to prevent them from falling into the wrong hands, but I’m afraid that will just encourage them to stock more. You can click on the above photo to see it bigger at flickr or just look at the partial close-up below. 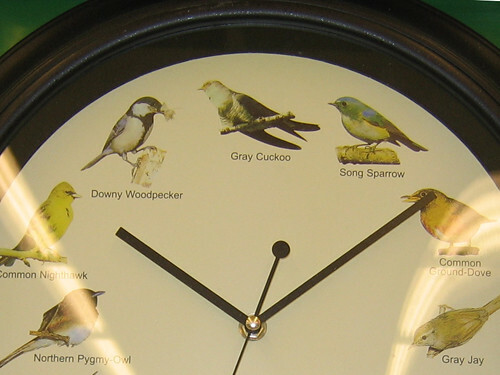 Of course I’d prefer a Birdorable clock anyway, if I’m looking for a bird-themed wall clock (even if they don’t sing). BirdBreath is a fun collection of bird-related comics published 5 days a week over at birdbreath.com. The regular cast of characters includes feeder birds & other wild birds as well as pet birds and the cartoons are cute and witty and worth checking out. You can embed the latest comics on your site and be sure to check out the BirdBreath books, too!